Easy to use mist will find and neutralize unwanted odors! Struggling to remove or even find the source of unwanted odors? The Meguiar's Whole Car Re-Fresher Odor Eliminator Mist will find the source of your unwanted odors and eliminate them directly at that source! If removing odors is not enough, this product is extremely easy to use. Simply place the Eliminator Mist on the floor near the air conditioner return, which is usually below the glove box, and turn on your cars fan. Make sure the fan is on high and air is being circulated throughout the car. Engage the cans locking trigger and close all of your car's doors and windows. Let the Eliminator Mist can empty and work through your entire air conditioning system (approximately 15 minutes). Once finished open the doors and let your car air out for about 10 minutes. This outstanding odor eliminator will have circulated throughout the entire system removing foul odors and adding a light and pleasant new car scent to the vehicle. 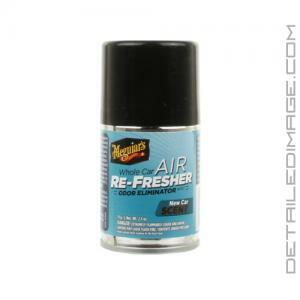 If you are looking to find and eliminate unwanted odors use the Meguiar's Whole Car Re-Fresher Odor Eliminator Mist! Finds odors wherever they are! The First Whole Car Odor Eliminating System! Has your car lost that "New Car" smell? Meguiar's advanced technology not only removes unwanted odors wherever they hide, but also leaves behind a pleasant new car scent - that lasts for weeks. Works great at removing smells like cigarette smoke, wet dog, work-out gear and more! * Meguiar'a Re-Fresher technology permanently removes existing bad odors through chemical bonding at a molecular level. Vehicle should be unoccupied. No person, pets, or plants. For best results remove any source of unwanted odor. Vacuum and clean any soiled carpet/upholstery. Park your vehicle in the shade and in a well ventilated area. Do not use more than one can, per vehicle, at a time. Start the vehicle with the fan set on high (circulated cold air) and close all windows. With the Air Re-Fresher nozzle facing away from you, activate its locking trigger. Place it in the center of the car (typically the floor between the front and back seats). Close all the doors for 15 mins. Open all the doors after 15 mins, turn off vehicle and let air out for 10-15 mins. Had a 2008 Dodge Nitro, worked easily and smelled great. However, even after cleaning interior, setting of product. The car still had a faint smell of cigarette smoke. BUT...the car had been smoked in since being purchased and my dealership was still satisfied as the car had many other issues! I look forward to trying this again with a car that was not so blatantly abused! Used this on a client's vehicle. It works well but remember to actually clean the interior and replace cabin air filter to kill the source of the smell. Used this product in a 14 year old CRV. The in cabin filters had been changed regularly but a musty odor would come and go. Followed the directions and so far so good. The fragrance is still going strong and the odor is gone. It's not obnoxious but rather subtle. Bought another can and did my 8 year old truck. Just be sure to follow the directions, they are easy.